Sometimes making it through a long afternoon can feel like a real struggle, especially if you are hungry. But eating the wrong snacks can pack on the pounds and leave you sluggish for the rest of the day. Try these three healthy and delicious treats to keep you satisfied until dinnertime. 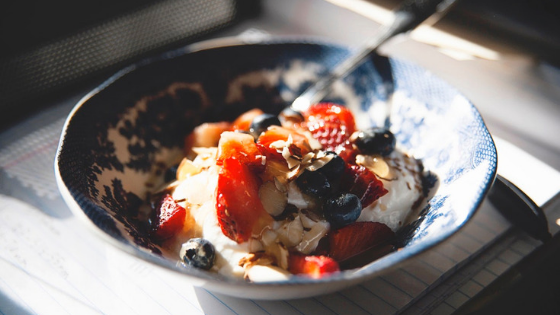 Thick and creamy, a 4-ounce serving size of plain Greek yogurt offers a boost of energy with about 11 grams of protein. That is almost double the protein and less than half the amount of sodium, carbs, and sugar found in regular yogurt. If you are watching your weight or sugar intake, you will want to stay away from the flavored varieties, since they can really increase the calorie count. That doesn’t mean you can't take your snacking to the next level by sprinkling a few berries and chopped nuts on top, but just don’t go overboard. This snack may sound like a decadent choice at 300 calories, and it is to some degree, but both dark chocolate and almonds provide a lot of health benefits in exchange. A 1-ounce square of dark chocolate with at least 70% cocoa solids has tons of flavanols, which some studies suggest can help lower the risk of developing cardiovascular disease. Almonds are a wonder nut, and a 1-ounce portion has 3.5 grams of fiber, 6 grams of protein and takes care of a significant portion of the daily recommended intake of manganese, magnesium, and vitamin E.
It may be the oddest fruit, but the humble avocado is hard to beat as a rich and creamy snack that is also nutritious. Half an avocado has tons of vitamins, plenty of fiber, more potassium than a banana, and may even lower bad cholesterol levels while increasing the levels of good cholesterol. Add a splash of hot sauce or salt and lemon to bring out the flavor fully. Are you looking for apartments in Chicago, overlooking the lake? North Harbor Tower offers a variety of floor plans to meet your needs, and residents have access to hotel-like amenities. Call us today for a tour of our available floorplans.